The Real Real Life Heroes! A popular post of mine at Dreams with Wings and I am glad being a contributor blogger here as well. Our world is going hither and thither with political instability, risk of domestic war, skyrocketing prices of food, health, clothes and education, high level corporate crimes, global warming(while I write this Nepal has recorded one of the hottest year in its history) and an economy that seems to befit only rich and ruthless. The time is such that we feel nothing at all is in our hand. It is difficult to combat these alarming concerns when day to day demand for job (and education for it) and family require much of our time. The shutdowns a few days back- I didn't want to walk to my college but there was nothing I could do. We cannot do anything when politically privileged announce impunity of their scandalous carders but still we live with the fact that much of our lives (and thus addressing the concerns) is much determined by these untrustworthy and recalcitrant (mis)leaders. In such condition feeling of impotency is understandably inevitable-will our stand on these critical common problem make any difference? Why should we continue making the effort? Amidst these we cannot neglect those great changes that the world has witnessed.The civil right movement of USA (Rosa parks and Martin Luther King Jr.), fall of apartheid (Nelson Mandela and Archbishop Desmond Tutu),Indian subcontinent's fight for freedom against East India Company (Mahatma Gandhi) (We might not know much about the movements but we do know about these people and its through their life stories we witness these great achievements) . BUT WHO AM I COMPARED TO THESE GREAT PEOPLE? 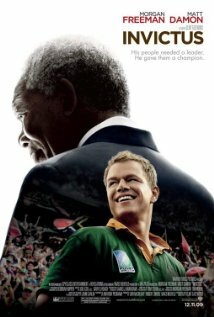 'Invictus', biographical sports drama film, depict Nelson Mandela as a perfect human being and mentions very little about his family life. The story of Rosa Parks (probably in 4th grade Gulmohar) pictures her as a black woman who on one lucky day decides to take stand (or the seat) against the unjust system in America. Mahatma Gandhi, he is a person who never lies; does all his work by himself and does nothing wrong! This is how most people see these real life heroes. The unreal stories of the real life heroes set up standards that are impossible to meet by an ordinary person. I have friends that don’t even know that Nelson Mandela did too have a family like a normal person and despite having to meet the same day to day demands he managed to get himself involved for justice. He was an ordinary person with ordinary flaws. The conventional telling however portrays him as saint who always fought for justice and never as an ordinary person. This gives us an idea that these people were never ordinary like us. They were gifted and that’s why they made the difference- an unreal story with ending up a misleading moral, making it harder for us to get involved. The real story, however are very ordinary and thus less intriguing. Conventional telling of Rosa parks' story presents her as a virgin to politics, and one day just like that she decides to not to give her seat to the white guy. The real story is lot different. Before refusing to give up her seat, she had been active for 12 years n local NAACP (National Association for Advancement of Colored People) serving as its secretary. She was motivated by her husband (so she does too have a family like all of us) to be a part of NAACP in the first place. So parks didn’t make a spur-of –the-moment decision and started the civil right moment in USA, but was a part of an existing moment of change. Also the lesson of the conventional telling seems to be that if any one of us suddenly do something heroic, that would be just as great. That might sound powerful but it doesn’t happen in real life. the real story however tells us a that she started with modest steps(and so did Mandela and Gandhi), that all of us can take. Hesitant, at first she slowly gained confidence and keeps on despite a profoundly uncertain context. Parks story tells us that change is a product conscious, incremental action, where all of us join together (see how she is motivated by her husband to join NAACP) and not something that comes just in an instant. Also her story tells us about the "chain of inspiration", throughout her term as a NAACP member she must have been inspired and helped by so many people that we don’t know(just like her husband, ED Nixon who served as one of her mentor). 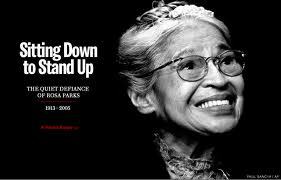 May be its difficult achieve something that Rosa park did however we can always be part of that" chain of inspiration" that made Rosa Park. Once we know that all these great people were ordinary people with ordinary flaws and yet they were able to bring critical change and the chain of inspiration we know that our stand will make a difference- feels like even I have a shot at bringing a change!!! Arun Upreti is a medical student, aspiring writer, social activist, and a cricket enthusiast . He works as a news analyst in Cricnepal.